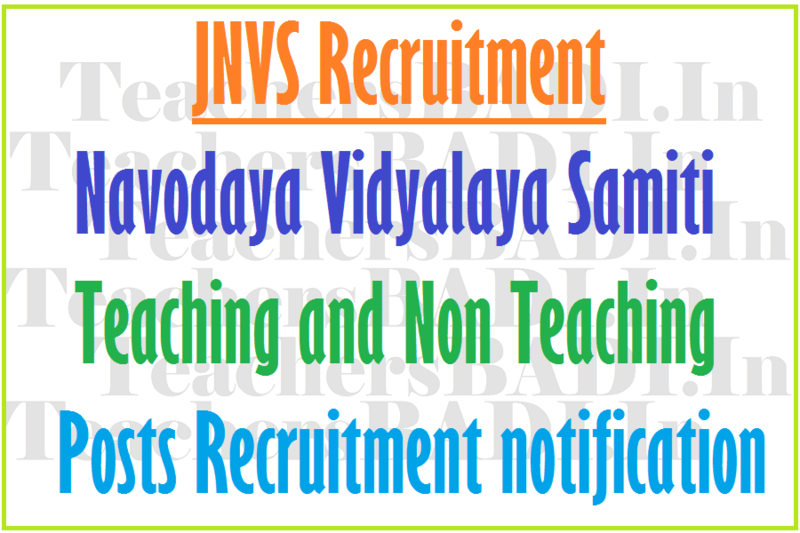 NVS Recruitment Admit Cards for Principal, PGT, TGT, AC Posts 2019. NVS Principals, PGTs, TGTs, ACs Recruitment Results, Admit cards 2017, NVS hall tickets, exam date, #NVS Recruitment 2017, #Navodaya Vidyalaya samiti 2072 #Teaching, Non Teaching Posts 2017 recruitment, Navodaya Principals, PGTs, TGTs, ACs Recruitment: Navodaya Vidyalaya Samiti (NVS) has published the Assistant Commissioner, Principal, PGTs, TGTs, Misc Categories of Teacher & TGTs (III Language) recruitment notification. Applications are invited from the eligible candidates and they may apply online from 10-09-2016 at 800 hrs to 09-10-2016 by 2400 hrs. Other details like age limit, educational qualifications, selection process, online application form, last date for apply, admit cards, how to apply and selection list are given below.. Candidates upper age limit should be up to 45 years for Assistant Commissioner, between 35 - 45 years for Principal, 40 years for PGTs & Misc Categories of Teacher & 35 years for TGTs and 06 as on 31-07-2016. Relaxation of age will be applicable up to 05 years for SC/ ST candidates and 03 years for OBC candidates as per GOI Rules & Other relaxation details refer the notification. TGTs &TGTs (III Language): Degree Course of Regional College of Education of NCERT or Bachelor’s Degree or equivalent in English as an Elective Subject/ Maths/ Physics/ Chemistry/ Relevant Subjects with at least 50% marks for Post No. 04 & 06 from a recognized University. (b) The Written Examination for the recruitment to the above mentioned posts is likely to be held at following 42 cities. However, the Samiti has the right to conduct the written test at all the cities or any one of the cities depending upon the number of the candidates and other compulsions. Number of centers in each city will depend upon the number of candidates opting for a city. The centre for the written examination for the post of Assistant Commissioner and Principal will be at Delhi Only. (c) Persons with disability of 40% or more, if so desires, will have to bring their own scribe to assist them in the examination. There is no restriction with regard to educational qualification or age etc. for the scribe. Compensatory time to be allowed in this case is 20 minutes per hour of examination. All candidates with disability not availing the facility of scribe may be allowed additional time of minimum of one hour for examination of three hours duration. In the case of PGTs, TGTs, Miscellaneous and TGTs (Third Language) 50 minutes additional time will be allowed since the duration of the written exam is 2 ½ hours. Reservation for person with disabilities in r/o the current year vacancies will be given as per the Govt. rules. However, posts are identified suitable for persons with disabilities will be as per O.M.No.16-15/2010-DD-III dated 29.7.2013 by Office of the Chief Commissioner for Persons with Disabilities , Ministry of Social Justice & Empowerment. (e) Schedule of examination will be intimated with the Admit Card. Detailed examination schedule will also be notified on Samiti’s website www.nvshq.org and www.mecbsegov.in in due course. (f) Based on the performance in written examination and also keeping in view the number of vacancies, the candidates will be called for interview. Intimation to this effect will be uploaded on the Samiti’s website www.nvshq.org and www.mecbsegov.in in due course. Candidates are required to check the Samiti’s website from time to time. Taking into account the performance of both written examination and interview, merit list will be prepared in case of Assistant Commissioners, Principals, PGTs and Miscellaneous Teacher(Art,Music,PET). However the mode of selection will be the sole discretion of Navodaya Vidyalaya Samiti and may be changed. Candidates should pay Rs. 1500/- for Post No. 01 & 02 and Rs. 1000/- for Post No. 03 to 06 through online. Application fee will be exempted to SC/ ST/ PH and Women Candidates. How to Apply: Eligible candidates may apply online through the website www.nvshq.org/ www.mecbsegov.in from 10-09-2016 at 800 hrs to 09-10-2016 by 2400 hrs. 1. The closing date for registration of online application is extended up to 16.10.2016 (2400 hrs) and last date to submit fee in bank through e-challan is 18.10.2016. 2. An edit window will be provided from 17.10.2016 to 20.10.2016 to make corrections, if any, in the online application forms already filled by the candidates. 3. Candidates, whose CTET is applicable for KVS and Govt of NCT of Delhi may also apply. 4. Reservation & Age Relaxation for various eligible categories are as per Govt. of India Rules. B. Written exam for the post of PGT, TGT, TGT Miscellaneous, TGT (IIIrd Language) scheduled to be held on 11.12.2016. 1. Click here to Download Admit Card for Written Examination for the Post of Assistant Commissioner and Principal Scheduled on 04.12.2016.